Shenzhen Ruizi Light Electricity Technology Co., Ltd. Is a professional LED tube manufacturer located in Shenzhen, China. 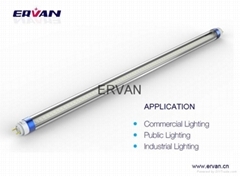 ERVAN is our trade mark. Our Company was founded in 2002 and started Researching and Developing LED tubes since 2005. Now, our tubes are upgraded to the top level in the world, and we are one of the top 10 LED Tube manufacturers. We set up on the firm belief of offering the high quality, unique design and fully warranted LED tubes to our customer at the most competitive price. We have a strong engineer team which composed of 16 individuals with perfect designers. Our management system is strictly conducted according to ISO9001-2008 standard. We always stay ahead of this field because of our talented creativeness, like Unique designed structure and attractive appearance, stable quality proved by VDE/TUV/CE/RoHS/FCC and UL/LM79 certificate. We have a great production group to ensure our production capability, 150 people on the production line to make sure 50,000pcs of tubes output every month. LED technology is high efficiency, cost effective, energy efficient and environmental friendly. Our goal is to keep on researching and developing super LED light, to offer a bright world. We will let the world know that "Green starts from ERVAN ".